Practice facilities: driving range, two putting greens, chipping green, bunker. Rangeballs are always free of charge. Clubhouse: restaurant, bar, cafeteria, changing rooms, proshop. Nestling around a small mountain the Lumine Hills course has a lot of character and some very interesting features. Three of the greens have been placed in old quarries giving them a scent of the “Wild West”, but otherwise the course can best be described as a slightly hilly parkland course. The course is both varied and technical forcing you to use all the clubs in your bag. As mentioned before the course offers some changes in elevation but many golfers prefer to walk the course. Practice facilities: driving range from grass tees, two putting greens, chipping green, bunker. Rangeballs are always free of charge. 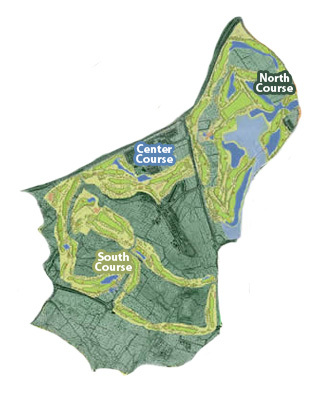 Designed by Greg Norman, the Lumine Lakes course is a true championship layout that will really test your golf. The holes have gently been laid out around a bird’s habitat which now has been declared a natural reserve. The course is easy to walk but buggies are always available. Even though it’s a challenging layout, amateurs can enjoy a nice round of golf since tees and hazards have been strategically placed. But as always, it’s a good idea to be long and straight off the tee!